My cousin, Lee Koldewyn, provided this photo to me. He obtained this photo from his grandparents, Andrew and Maria Hewitt over 50 years ago. He believes the photo is of family, but is unsure about who. I offered to post it for him to see if that will give any other leads. From the face of the photo, it was photographed by H. H. Thomas of Washington Avenue, Ogden, Weber, Utah. Heber Harris Thomas ran his Washington Avenue shop from the late 1880s to 1909. He started his shop and was called to serve a mission to the British Isles. He returned about 1890, so this photo is likely in that time period between 1890 and 1909. The clothing would definitely point to the 1880s and 1890s, but an older woman into the early 1900s might still be wearing that fashion, so the clothing fits the time period but does not narrow the years. Lastly, the lady is older in the photo. At a minimum she is 70, so we are looking for a person that is over her 70th birthday or so during when Thomas was running his studio. Maria Hewitt is a sister to my Berendena Van Leeuwen Donaldson (1898 – 1959). Maria Van Leeuwen was born 15 November 1893 in Ogden. Her parents were George & Harmina Van Leeuwen. 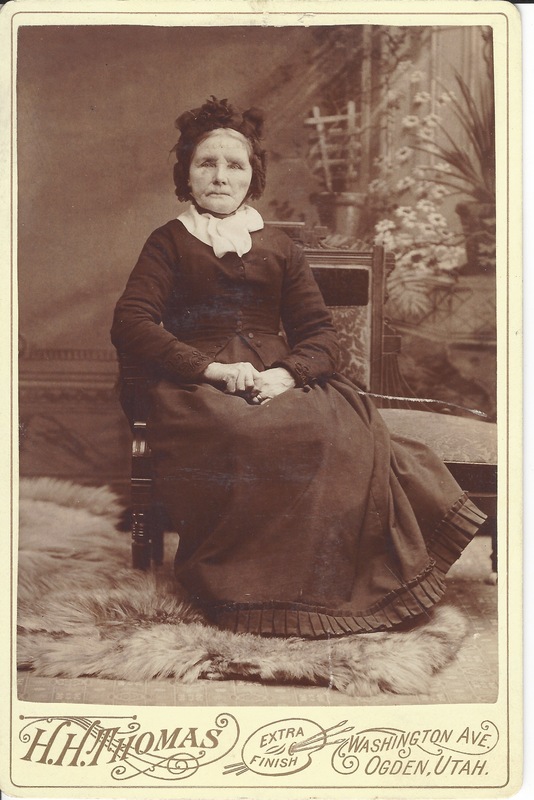 None of Maria’s grandparents made it to Utah from Netherlands to have their photos taken in Thomas’ studio. I have enough pictures of Harmina Janzen Van Leeuwen (1860-1921) to know that the photo is not of her. That means we can turn from my Van Leeuwen clan to that of the Hewitt clan. Of course, we have nothing to say for certain whether this photo is a relative of Andrew George Hewitt, but there is an assumption this person is related to Andrew. Andrew George Hewitt was born 17 September 1892 in Marriott, Weber, Utah. His parents were George Joseph Lemuel Hewitt (29 February 1872 – 7 March 1946) and Prudence Ekins (22 May 1862 – 18 November 1948). While Prudence lived to be 86 years old, her time over 70 is outside the time frame for which Thomas was photographing in Ogden. She is not a candidate. George Joseph Lemuel Hewitt’s mother was Clarissa Wilson born 29 April 1836 in Green, Richland, Ohio. She passed away 18 August 1890 in Ogden. She died at the age of 54. I could not locate any photos for her. While she fits the location, she does not quite fit the correct time frame for the age of the lady in the photo nor is she quite fit the time frame for Thomas’ studio. Does not seem a likely option. 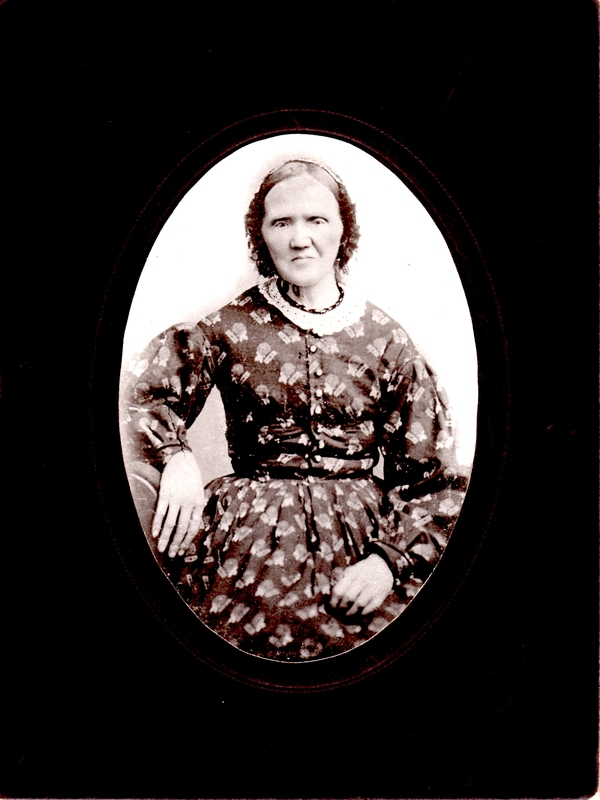 Prudence Ekins’ mother was Rebecca Burnham born 20 March 1829 in Moulton Seas End, Lincolnshire, England. She passed away 29 September 1894 in Slaterville, Weber, Utah. She died at the age of 65 years. I could locate some photos of her and she was a thin, narrow faced woman. She does not appear to have any relation to the woman in the photo. Her location fits, her age is not quite so sure, and Thomas was operative during that time. That excludes both of Andrew’s grandmothers. Does he have any great grandmothers who might match? Clarissa Wilson Hewitt mentioned above was the daughter of Agnes Hunter. Agnes Hunter Wilson was born 27 December 1811 in Erie, Erie, Pennsylvania. She died 7 February 1886 in Ogden. While I could not find out the exact year Thomas opened his studio, there may have been some overlap in time frames. She died at the age of 74. The only photos I could locate of her was when she was younger. A number of features of Agnes could match the woman above, but there were also many distinguishing features. The nose, mouth, and lines of the younger Agnes Hunter Wilson just do not seem to fully line up. However, I could maybe be convinced that Agnes was a relative of the lady above. Here is Agnes Hunter Wilson’s photo from FamilySearch. Matching the photos, if this is indeed a photo of Agnes Hunter Wilson, shows similar bone structure, but very different noses and mouths. I am not convinced these are one and the same, but could they be related. Agnes had one sister, Mary, but she died in 1878 and could not have been photographed by Thomas. Comparing the photos of Agnes’ daughters (Clarissa’s sisters) and none of them fit the bill. I could not find photos of all the sisters and the ones I did do not match the woman at the top. None of Clarissa’s daughters would have been old enough to be photographed by Thomas. Ultimately, I am not convinced this is Agnes Hunter Wilson, nor could I find an ancestor of Andrew Joseph Lemuel Hewitt that seemed to match. Nothing of the family resemblance matches the Van Leeuwen side. Hopefully I have provided enough information someone could find this post. Hopefully someone has a similar photo of this woman to make the connection.